Downton Abbey season 4, reviewed. But Downton Abbey stays the same. The new season picks up six months after Matthew Crowley met his premature end in last season’s Christmas special. 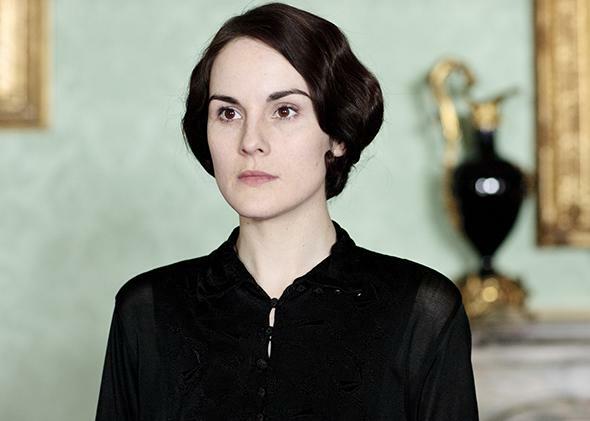 The Abbey is shrouded in darkness and mist and mourning, with Lady Mary, Michelle Dockery, ready to give up on life. The first clanging restatement of Downton Abbey’s major theme arrives just seven minutes into the new season, the show’s fourth, which begins Sunday night on PBS. The dowager countess, played by the still-impeccable Maggie Smith (who, upon reading each new season’s screenplays, must now roll her eyes inwardly as often as her character does outwardly), is kibitzing with the hapless servant Molesley’s father. (These Brits may go on and on about their stiff upper lips, but they yak like yentas.) “He’s a properly trained valet—he could even be a butler,” the dowager exclaims. Yes, his father agrees, “But it’s a changing world.” The countess replies, “You don’t have to tell me,” or, really, anyone who has ever watched Downton Abbey. The show remains more dedicated to restating its topic sentence than the most obedient ninth-grade composition student. An electric mixer arrives in the kitchen, sending Ms. Patmore into paroxysms of on-the-nose dialogue. “Before too long her ladyship could run a kitchen with the help of a woman from the village,” she shouts, only to later, secretly, attempt to work the damned thing because otherwise she’ll be “stuck in the past, don’t you see!” Lady Edith goes to see her own very mild-mannered Rochester, the married-to-a-lunatic magazine editor Michael Gregson, and murmurs, “The war changed everything”—trying to turn a thesis statement into a flirtation. (Edith has always been a remedial flirt.) Cora hollers at Lord Grantham, “Am I only the member of this family living in the 20th century?” Later in the season, Shirley Maclaine appears, still dispensing dialogue about British stodginess like some Teddy Ruxpin programmed only with pro-America propaganda. In other words, the world may be changing, but the status quo holds sway on Downton Abbey, where everything is more or less the same, even though everyone constantly frets that it is not and, sometimes, lovely young people die. Within the timeline of the show, it has been 11 years since the first episode, but the characters have barely aged. They largely remain employed by the great house, or waited upon in the great house. The Abbey is constantly in trouble, but as the only title character, it can’t die. The show makes Granthams of all of us: content with what we have now (a middling costume soap opera) because we can still remember its glorious past (that first season). It’s safer and cozier than a show about open class warfare. The new season picks up six months after Matthew Crowley met his premature end in last season’s Christmas special. The Abbey is shrouded in darkness and mist and mourning, with Lady Mary ready to give up on life. Over the course of the premiere, and then the season, she is prodded to take an interest in Downton’s fortunes, a story line in keeping with the season’s milder, quieter tone. After last year’s weddings, aborted weddings, births, and major deaths, the show mutes the drama, focusing on things like Carson’s vaudeville past, Molesley’s need for a job, Mary’s flirtatious suitors, Edith’s complex romantic entanglements, and, above all, the essential wholesomeness of an era when everyone knew their place. In creator Julian Fellowes’ imagination, every time a member of the servant class talks about being a “lady’s maid” with real pride, an aristocrat gets knighted. Over Downton’s run, Fellowes has revealed himself to be almost entirely incapable of making happy couples interesting, and so there are occasional big-time soap opera turns, used to inject some tragedy into otherwise dull romantic bliss. (For this reason alone, the show’s blatant snobbiness about giving anyone downstairs a good love story—What does Daisy have to do to get some freaking attention? !—is a blessing in disguise. Were Daisy finally to get some, she would instantly become as boring as Anna.) Lady Mary had barely anything to do last season, married off and happy. This season, alone again, she can mourn and quip and flirt. Anna and Bates, a Hallmark card of domesticated servitude, finally get something to do, a turn of events that may upset many viewers (and did when this storyline aired in Britain) but surely not Joanne Froggatt, who must be ecstatic to play something other than simpering happiness all the time. But even in tragedy, Anna remains a very good woman. The inhabitants of Downton, at their core, remain almost exactly as first written. Some of the characters were initially conceived with complexity. Thomas arrived on screen with his unscrupulous ambition; Lady Mary with her iron will, sharp tongue, and imperial lion heart; Edith with her perpetual, painful second-bestness. Written this way from the start, they all get to toggle between dull decency and enlivening bad behavior. But Mrs. Hughes, Carson, Patmore, Daisy, and Cora are all unerringly good-hearted and well-meaning. (Fellowes’ paternalism is reserved for the servants and, also, the erstwhile American Cora.) Perhaps the only character who has truly changed is Branson; he once wooed Lady Sybil by being a know-it-all jerk with revolutionary politics, and has now become fully house-trained—an outsider who believes in his in-laws’ essential decency. The rigidity of the characterizations gets downright weird this season with Lord Grantham and Bates, whom the show continues to present as good and righteous men, despite copious evidence to the contrary. After nearly losing Downton multiple times because of his fiscal mismanagement, Lord Grantham is still seen, and sees himself, as wholly competent. He is basically a Jane Austen character: the well-meaning dolt whose every business investment fails, but who continues to lecture everyone about what is decent and right. But instead of Austen’s skewering eye we view him through Fellowes’ near-worshipful gaze. Bates is even worse, a generous, doting, reliable husband who—based on events though not Brendan Coyle’s performance—may or may not be a homicidal maniac. Needless to say, Downton Abbey would be a lot more interesting if he were. Correction, Jan. 3, 3014: This article originally misspelled Molesley’s name.